Home Solutions Midwest is a BBB accredited, licensed and award winning contractor that excels in window installation, door, gutter, awning, siding installation and many other types of work. At Home Solutions Midwest we offer many high quality and affordable window installation styles and options that pays for itself through durability & massive energy savings. Make sure to view our very satisfied customers in your local neighborhood by viewing our before and after pictures and customer reviews. Get a FREE estimate today on a window installation or any other service by clicking the FREE estimate button below. Renewal by Andersen is backed by Andersen Corporation; the most trusted family of window brands in America. With 112 years of experience in the industry, Renewal by Andersen is your one stop shop for window replacement. Through their blend of a team of experts in the industry, a high-caliber proven system and custom merchandise, Renewal by Andersen's Signature Service is pledged to going that extra mile for their customers. Dreaming of a new bay window to accentuate your living or dining room and let in more beautiful, natural light? Renewal by Andersen offers a wide array of custom replacement windows and doors. Homeowners may choose from a variety of style and color options including double hung, casement, bay and bow, picture, sliding and more! All of Renewal by Andersen's replacement windows are fully customized for each customer's project. Let Renewal by Andersen's trained experts help you find the perfect product that's right for your home. All of our windows come with a 100% satisfaction guarantee. We will install your replacement windows with careful attention to detail and workmanship. If you’re not happy with the job, we’ll come back and fix it. We pride ourselves on open and honest communication with all our customers. 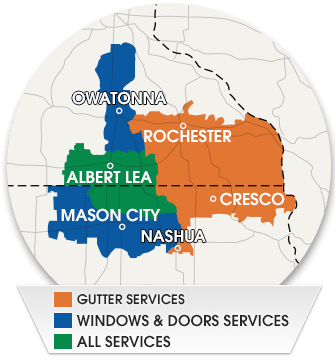 Thousands of homeowners in Rochester and Southeast MN & Northern IA have discovered the advantages of choosing Renewal by Andersen window replacement from Home Solutions Midwest. We believe in making the home renovation process as easy as possible for our customers. We start with a no pressure initial consultation, giving you the opportunity to speak with us about your budget and your design ideas. Once we’ve made a plan for your window installation, we lead you through the whole process from design to final site cleanup. We’re here to answer your questions at every stage. We are proud to be a local company that never uses subcontractors. Would you like to learn more about Home Solutions Midwest and our replacement window solutions? Get in touch with us today. Our in-home representatives are ready to speak with you about your needs. Call us at 1-844-665-0388 or fill out our convenient online form for a free estimate in Austin, Owatonna, Winona, Farmington, Northfield, Albert Lea, Faribault, Northfield, Rochester, Mason City, and nearby in MN & IA.